Today, Hereditary Grand Duke Guillaume and Hereditary Grand Duchess Stéphanie completed their second to last visit on their of the Grand Duchy's 15 Centre de Développement et d'Attraction (CDA) when they visited Remich in the south-east of the country. The only visit left now is the one to Wiltz. At 10am this morning, the Hereditary Grand Ducal Couple arrived to the city on the left bank of the Moselle river. After being welcomed at the local town hall by Remich's mayor Henri Kox, the Hereditary Grand Duke and Hereditary Grand Duchess made their way to the community centre Al Schoul where they viewed a photo and video exhibition about the flood history of the town entitled "When the Moselle comes". Afterwards, they visited the local retirement home St. Joseph to have a chat with the elderly. 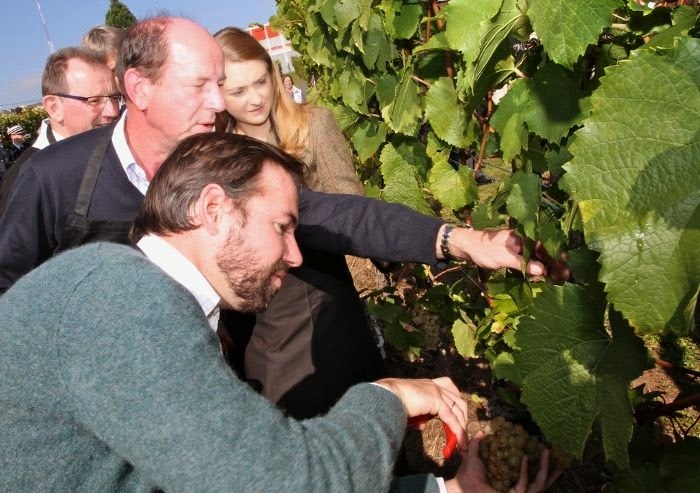 After a change of clothes into some better suited attires, Hereditary Grand Duke Guillaume and Hereditary Grand Duchess Stéphanie visited the Institut Viti-Vinicole, the Grand Duchy's viticultural institute, where they learned all kinds of things related to Luxembourgish wine and sparkling wine production and even got the chance to little harvesting themselves. The visit was rounded off with a wine degustation of local products. As always, the lovely people of Wort have more visuals of the day, as does RTL.